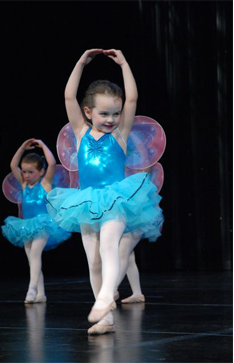 Our Preschool class is a 30-minute combination class introducing ballet and tap. Dancers learn creative movement and motorskills developed in both techniques. It is designed to build coordination, rhythm, to be able to follow a series of directions, and most of all for enjoyment. We do wear ballet slippers and learn barre exercises and ballet terminology. We wear tap shoes as a rhythmic tool. With ballet slippers on you really cant hear the difference between a march and a skip. Now with the tap shoes on you can hear straight 4/4 time and the difference in the skip of syncopated timing. All while incorporating obstacle courses, sequined arches, flags and more. We put on an annual recital in May at Hancher Auditorium. All classes begin work on this piece the 2nd semester. Our Kindergarten classes offer 2 different combination classes. Ballet and tap classes do a ballet barre, across the floor combinations and a center floor routine in each class. Tap classes focus on simple tap steps and also use the shoes as a percussion instrument for rhythmic purposes. The jazz portion is fun music with simple progressive jazz combinations. The class will need correct shoes and will do just one routine for the recital. We won't know the technique they will be doing until the 2nd semester. For all ages and levels ballet classes are instructed to classical music and begin with a ballet barre – continue with across the floor combinations, turns, and leaps – finishing each class with a center floor routine. Our classes are a classical jazz based technique. For all ages and level the jazz class begins with a center floor warm up of stretching and strengthening exercises. – continue with across the floor combination, turn, and leaps – finishing with a center floor routine. For all ages tap is producing rhythmic sounds with your feet. As the levels progress the sounds get more intricate and cleaner. Following the technique class format of barre – across the floor and center floor routine. More of a freestyle, interpretive technique combining the techniques of ballet, jazz, and modern. Not as regimented and constrictive as a ballet class but a very disciplined technique. Modern is a style of theatrical dance that rejects the limitations of classical ballet and favors movement deriving from the expression of inner feeling. NDA offers a taste of all aspects of modern dance fusing movement derived from Grahm, Horton and Limon techniques. We are excited about personally creating this new class. It is not gymnastics. It is not tumbling or acrobatics. It is a combination of all; without allowing the technique and muscle memory of ballet to get away. All dancers need to strengthen and gain flexibility in their backs, legs and arms, without the fear of losing dance technique.